As refugees are forced out of Sudan and flock to the newly-created country of South Sudan, the problem of poverty, hopelessness, and homeless children in the town of Wau has increased substantially. Civil war, raging since 2013, has dramatically altered lives. Refugees find a devastated land with overwhelming shortages of homes, infrastructure, hospitals, schools, and jobs. This level of poverty leaves many parents unable to provide for their children who are then left to wander the streets in search of food and help. 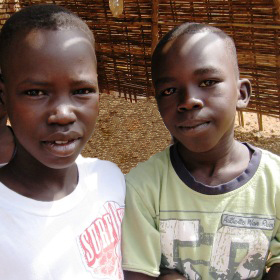 In 2007, Kids Alive opened the Good Shepherd Home in Wau, where boys who had previously lived on the streets or came from abusive homes can now life in safety. There is a wonderful atmosphere in the home as the boys now have their physical, emotional, educational and social needs met. Active in the local church and participating in Sunday School, choir, and drama groups, many of them have very real relationships with Jesus Christ. We are encouraged by the progress that each has made since they came to us! Originally in rented accommodations, we have now constructed two homes on the property where 32 boys live. Now these boys have a loving home and are receiving an education that will help prepare them for the future. We are also working with families in the community, focusing particularly on helping more children from very poor backgrounds get an education. Support the Ministry of Good Shepherd Home with Your Gift Today.